Among the most badly handled, most interesting, most distorted, and most eclectic of aerospace history subjects is the origin of the use of the circular, elliptical and annular wing platforms (shapes) in aircraft design. Long before Kenneth Arnold initiated the modern age of the societal phenomenon known as UFO, there were already "flying saucers" that had little in common with spacecraft from other planets. Any enthusiast of aviation history will have encountered sketches of "flying saucers" and discoidal aircraft more than once in aviation catalogues and publications. In his own day, Leonardo Da Vinci had already sketched the outlines of circular vehicles: war wagons, movable fortresses, and other artefacts which, had they been endowed with the power of flight, would be the perfect ancestors of our "flying saucers." Later on, in 19th century Germany, as a foreshadowing of the Nazi saucers which have given modern ufologists such migraines, mathematician and aviation theoretician August Wilhelm Zachariae, nowadays forgotten by aeronautical history, experimented with circular wing prototypes. 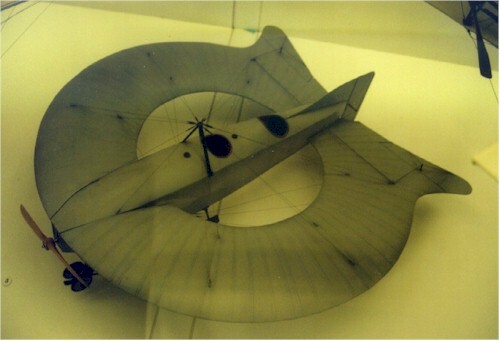 In 1922, Lee Richards, an Englishman, developed a circular wing aircraft in Britain which should have been able to attain speeds of 130 KMH and a taxiing speed of some 35 KMH. During the 1930's a number of circular wing aircraft were built in the United States, some of which would eventually confuse ufologists, who took them as evidence of UFOs which had crashed on American soil. On one hand, H. Zimmerman conducted several tests in 1932 with a variety of circular wing aircraft inside a wind tunnel in order to prove the lesser degree of distension in their extremities. The results of these tests were published in "Technical Report 431," issued by NACA (known today as NASA), producing a genuine sensation and leading to the creation of US patent 2,108,093. A practical use for them would be found later on in the "Chance Vought 173" whose maiden flight occurred in 1942. Another of these designs, which according to German aeronautical magazines, "should have been endowed with good short-landing characteristics," was the first of the Caldwell aircraft. A former carpenter, Jonathan E. Caldwell had learned aeronautical engineering on his own. His natural aptitude for that discipline was such that he managed to create his very own aircraft manufacturing company. The Grey Goose Company--Caldwell's enterprise--had designed at least two kinds of circular wing aircraft. One of them was a small helicopter featuring a conventional fuselage, but mounted over the cockpit was a tripod which held a large disk, four meters in diameter, with protruding gyrating blades. The other prototype, which was by far more sophisticated, boasted a structure closely resembling that of a spool, composed of two steel-reinforced plywood frames, which resembled large cheese boxes. Both sections--designed to rotated in opposite directions and equipped with a short-bladed rotor that protruded around the edges--were separated by the pilot's cockpit, which was located near the engine bracket. In spite of the fact that Caldwell's circular-wing aircraft test flights began in 1935, I have references from the University of Miami that indicate the same design of aircraft at least a year earlier. In May 1949, officers of the U.S. Air Force assigned to the collection and study of UFO reports received a letter from a Maryland citizen who claimed having purchased stock in the Gray Goose Company, a small local firm engaged in building odd aircraft similar to the "flying saucers" bandied about by the press in those days. We must keep in mind that two years earlier, the psychosocial phenomenon known as UFO had kicked off on June 24, 1947. Following up on the Marylander's claims, an Air Force team, accompanied by the Maryland Police, visited a old farm in Glen Burnie which had doubled as a hangar for Caldwell's local aeronautics firm. The remains of a pair of Jonathan Caldwell's circular-wing aircraft were discovered inside a ramshackle hut located in this suburb of Baltimore. Apparently, his skill with aircraft did not match his business sense, and this led him to bankruptcy. The resourceful Caldwell had no problem with selling stock in his company whenever he had financial difficulties, and such disintegration led him to ruination. 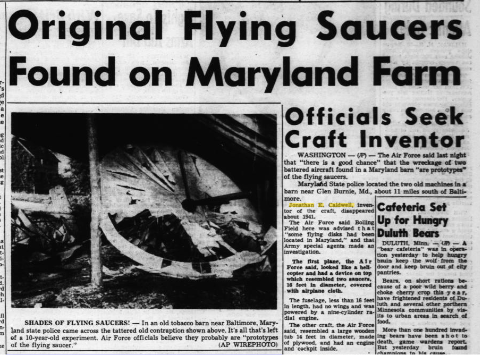 Around 1940, When the Maryland tax authorities began to take an interest in the engineer's file, he disappeared, leaving behind the remains of his of his earliest "flying saucers." 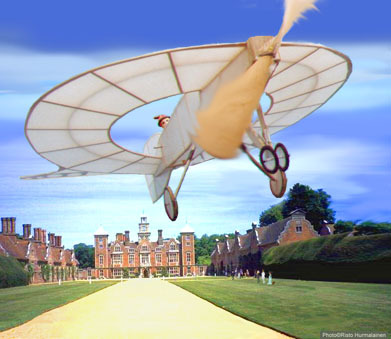 In time, researchers managed to find a man who had allegedly piloted one of Caldwell's circular-wing aircraft over Washington, D.C. ten years earlier. Based on the date of the presumptive flight and in the pilot's description, who stated that the Caldwell airplane had not risen above a few tens of meters during the span of a few minutes, the Air Force concluded that those prototypes could not be responsible for the "flying saucer" reports that were being received from all around the country. 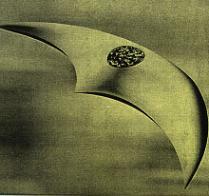 Nonetheless, the photographs of the remains found in the Gray Goose Corporation's shed, the early American prototypes of circular-wing craft, have frequently appeared in UFO books and magazines related to alleged "crashed" saucers. Place of Sighting: C 14 Flight School at the Prag-Gbell aerodrome. Date of Event: August/September 1943, supposedly on a Sunday (I seem to recall there were no services on that day. The weather was good, dry and sunny. Kind of Observation: "I was with my flight comrades on the air strip, more precisely, near the school buildings, some 2000 meters away from the arsenal (located to the extreme left). See adjoining diagram. The device was inside the hangar: a disk some 5-6 meters in diameter. Its body is relatively large at the center. Underneath, it has four tall, thin legs. Color: Aluminium. Height: Almost as tall as a man. Thickness: some 30 - 40 cm., with an rim of external rods, perhaps square orifices. The upper part of the body (almost a third of the total height) was shrunken over the upper half of the disk. It was flat and rounded. Along with my friends, I saw the device emerge from the hangar. It was then that we heard the roar of the engines, we saw the external side of the disk begin to rotate, and the vehicle began moving slowly and in a straight line toward the southern end of the field. It then rose almost 1 meter into the air. After moving around some 300 meters at that altitude, it stopped again. Its landing was rather rough. We had to leave the area while some custodians pushed the vehicles toward the hangar. Later on, the "thing" took off again, managing to reach the end of the aerodrome this time. Afterwards, I made a note in my flight log of the members of the FFS C14 who were present at the moment: Gruppenfluglehrer (group flight instructor) Ofw. Michelsen; Fluglehrer Uffz. Kolh und Buhler; Flugschüler (flight students): Ogefr, Klassmann, Kleiner, Müller, Pfaffle, Schenk, Seifert, Seibert, Squarr, Stahn, Weinberger, Zöbele, Gefr, Hering, Koza, Sitzwohl, Voss, and Waluda. Certainly, even Flugzeug's editors treat the report cautiously: "the device described by these observers is antithetical to those described by Schriever, Habermohl, Miethe, and Bellonzo with their vast basic dimensions." And these German experts cannot be mistaken, since it is known to all of those who are well-versed in aeronautics that during the history of Nazi aviation at least two circular-wing aircraft were built, and fifteen others were designed, although there remains the possibility that the object supposedly tested at Prag-Gbell was one of the prototypes destroyed by the Nazis in order to keep it from falling into Allied hands after the fall of the Third Reich. The history of German "flying saucers," unmindful of previously mentioned antecedents such as the designs of August Wilhelm Zachariae, begins with Alexander Lippisch, who developed his Delta-winged rocket-fighter, the Me-163, since early 1939 for Augsburg's Messerschmitt, and which was later produced in a series. Lippisch also researched the circular-wing endeavors of 1940-41 in AVA's wind tunnel at Göttingen, although without obtaining spectacular results. 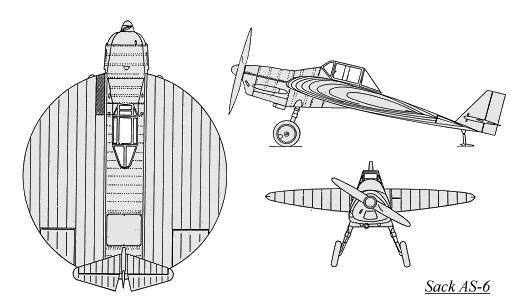 Toward the late '30s, another German was also designing circular aircraft, even more interesting than the ones by Zachariae. His name was Arthur Sack, a farmer from Machern (near Leipzig). A fan of model aviation, Sack decided to put aside the speculation about "flying saucers" and get working on one such model. 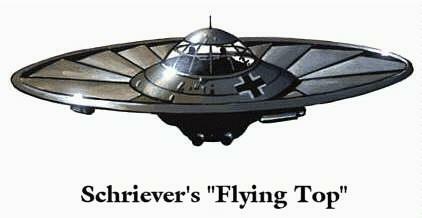 Although aeronautical publications such as Luftfahrt International, Air International, and RAF Flying Review published photos of this "Nazi UFO", we have no idea what inspired Sack, yet his saucer exists: It is a flat, circular aircraft, sporting the colors of the German Luftwaffe. Only two photograjs with no additional details have been preserved. The "saucer", with its impeccable military aspect, has a canopy reminiscent of the old Me109, the star of World War II fighters. The existence of a wooden propeller and a rigid spur can lead one to speculate that this vehicle was intended as a worthy opponent to the Mustangs, Thunderbolts, and popular Spitfires of the Allies. AS6, The Story of a Nazi "UFO"
The public presentation of Sack's flying saucer took place during the celebration of the First National Contest for Air Models With Combustion Motors,held on the 27 and 28 of June, 1939 in Leipzig-Mockau (Germany). Arthur Sack's model measured 1,250 mm and weighed 4,500 grams, powered by a built-in Kratmo-30 motor, 0.65 V and 4,500 RPM with a propeller measuring 600mm in diameter. Those participating in the event, which was wisely held behind closed doors, had to cover a round-trip flight utilizing the simplest guidance mechanism available. Nonetheless, this early attempt at using small models for tactical reconnaissance purposes proved to be a resounding failure. Most of the models, fitted with the so-called "self-guidance device" and their respective motors, displayed their worst qualities. The only truly remotely guided model, built by Sinn, broke down at the starting line, while another, equipped with a steam turbine built by Soll, caught fire. It was a veritable disaster. Sack didn't escape the rash of bad luck. His "flying saucer" was unable to lift off the ground, and finally, Sack had to throw it into the air himself. After this "assisted takeoff", the model managed to perform 100 meters of stable flight, just barely reaching the finish line. Sack fine-tuned his designed following this experience in order to achieve longer, quicker flights. In spite of it all, Arthur Sack was extremely fortunate, since among the spectators to the event was General-Air Minister Udet, who was deeply impressed by the concept. Udet became a strong supporter of the military use of "flying saucers," assigning them the role hitherto developed for barrage balloons. He promised Sack that he would "smooth the road for further research." No sooner said than done: Arthur Sack built some additional "flying saucer" models prior to beginning the construction of a manned aircraft in the midst of the war years at the MIMO plant (Mitteldeutsche Motorwerke) in Leipzig. The final design, which received the nomenclature of AS6, was completed at the Brandis flight shop (Flugplatz-Werkstatt) in early 1944. The very first AS6 prototype was equipped with an Argus 10cc, 140 HP engine, and a 6.40 meters thick circular wing with a Göttinger profile. For a flight weight estimated at some 750 - 800 kgs., the wing load must have been some 25 to 30 kilos per square meter. Therefore, it almost fit within the measurement parameters of a Klemm 25D. Finally, with the prototype already in the hangar, all that was needed was to find a pilot--which Sack was not--and begin testing. The aircraft makes a very positive impression, and its external aspect is very good. However, it cannot be categorically described as a clean piece of work, taking into consideration the resources available at Brandis for its utilization. Baltabol's statement turned out to be prophetic, as the first experiments with the "flying saucer" were burdened with complications. During the prototype's initial roll-out, both the shape and an unfortunate pedal adjustment caused the rudder and the brake to fail. A crack in the spur put a premature end to this early attempt. The spur was strengthened later on by a steel rail in the fashion of a faired beam, and as soon as the pedal was relocated to a more convenient position, the test flight took place. Baltabol attempted five takeoffs from the 1.2 Km runway at Brandis, but the rudder was extremely hard. The right strut on the landing gear cracked during the final effort. Upon examination of this problem, the pilot's advice regarding the transference of the landing gear some 20 cm. to the rear was implemented, a move that required reinforcement of the aircraft's rear. But in the end, the measure would be redoubled, since the builders believed that the landing gear should be moved back by 40 cm., which would cause the prototype's nose to tip forward, and Baltabol refused to accept the responsibility for a takeoff under such conditions, particularly considering the subsequent changes effected to the rudder and the braking pedals. In spite of these and other modifications, the AS6 did not take off on its following test: after rolling down the runway some 600 meters, the aircraft's nose showed no inclination whatsoever to lift off the ground. New modifications were made and a new attempt was executed. This time, the saucer would roll to the runway's maximum length of 700 meters in total calm (there was no wind). When Baltabol accelerated, the AS6 picked up speed and after 500 meters down the runway, its landing gear lifted off the ground. The Nazi saucer had made its first leap into space. However, the illusion was as brief as the leap itself. The aircraft touched down once more, and after several pilot-controlled bounces, Baltabol decided to forgo the takeoff attempt upon seeing the end of the runway grow dangerously near. For the following test, Baltabol took advantage of lift forces, causing the machine to roll at a greater angle, thus obtaining a longer--but not higher--skyward jump. A sequel to the test, conducted the same day, did not meet greater success, since the propeller gave the vehicle a strong inclination which interfered with its movement. According to Luftfahrt, Baltabol suggested that a new series of wind-tunnel experiments be performed in order to calibrate the vehicle's exact flight and takeoff characteristics. Later on, it would be another pilot, Franz Rösle, who would test Sack's flying saucer in the summer of 1944, although he too would experience certain difficulties, such as a new crack in the landing gear.The harried final month of the war surprised the Brandis field, interrupting testing on the AS6. From that moment onward, the prototype's story is lost amid the confusion of the armed conflict. Nonetheless, Luftfahrt points out that in the fall of that very same year, a flying saucer was sighted over the Neubiderg aerodrome, near Munich. There exists the possibility that this UFO was proof that the AS6 had finally overcome all its technical setbacks. In any case, the AS6's complex history, from a model imagined by a German farmer to its manufacture as a Nazi military prototype, constitutes a fine example of the existence of "flying saucers" half a century ago, which bore no relation whatsoever with alien spacecraft...and it wasn't the only one. In 1959, German publishing house J.F. Lehmanns Verlag, based in Munich, was publishing the third edition of Die Deutschen Waffen und Geheimwaffen des 2 Weltkriegs und ihre Weiterentwicklung (Germany's Weapons and Secret Weapons of the Second World War and their Later Development). The author of this German manual was Major Rudolf Lusar, who devoted a section of the chapter entitled "Special Devices" to Nazi saucer designs. German scientists and researchers took the first steps toward such flying saucers during the last war, and even built and tested such flying devices, which border on the fantastic. According to information confirmed by experts and collaborators, the first projects involving "flying discs" began in 1941. The blueprints for these projects were furnished by German experts Schriever, Habermohl, Miethe, and the Italian expert Bellonzo. Habermohl and Schriever chose a flat hoop which spun around a fixed pilot's cabin in the shape of a dome. It consisted of steerable disc wings which enabled, according to the direction of their placement, in horizontal takeoff or flight. Miethe developed a kind of disk 42 meters in diameter, to which steerable nozzles had been attached. Schriever and Habermohl, who had worked together in Prague, took off on 14 February 1945 in the first "flying disc." They attained a height of 12,400 meters in three minutes and a horizontal flight speed of 2000 KMH. It had been expected to reach speeds of up to 4000 KMH. Massive initial tests and research work were involved prior to undertaking the manufacture of the project. Due to the high rate of speed and the extraordinary heat demands, it was necessary to find particular materials in order to resist the effects of the high temperatures. Project development, which had run into the millions, was practically concluded by the final days of the war. All existing models were destroyed at the end of the conflict, but the factory at Breslau in which Miethe had worked fell into the hands of the Soviets, who seized all the material and technical personnel and shipped them to Siberia, where successful work on "flying saucers" is still being conducted. The myth about Schriever's "flying top" and the other fantastic discoidal aircraft designs quoted by Lusar would have no currency whatsoever, were it not for the large number of journalistic references from that time which allude to such vehicles. While the "magical" technology of the "flying tops" described by Lusar is incompatible with the fits and starts to get the AS6 airborne, it would be absurd to utterly deny their existence as a result of contradictory names and dates of the different journalists who dealt with the matter. It is enough to read a chronicle of a given modern event in five different newspapers to find an endless number of contradictions. W.A. Harbison, author of Genesis, documented his tale with personal research in West German archives and periodical libraries, discovering large amounts of press and magazine clippings, all dating to the Fifties, concerning Rudolf Schriever and his astonishing discoidal designs. To this end, we questioned Justo Miranda, an aviation historian and model-maker with 20 years' experience, founder of the A Escala modelling magazine and an expert on terrestrial UFOs. The first one among them to fly was a conventional vehicle (the AS6 V 1 described earlier), which was powered by a propeller motor, and taxied up and down the runway without ever taking off in April 1944. This low level of performance shouldn't surprise us, since Professor Alexander Lippisch, in cooperation with Messerchmitt, demonstrated in 1941 that circular wings (profile K 1253) had very low aerodynamic performance. On the other hand, Johnson and Caldwell, in the United States, unsuccessfully built similar devices in 1935-36 (they went bankrupt). They tried again during wartime with the U.S. Navy's Chance Vought XF5U-1, which was rejected for active service in spite of the addition of all kinds of rudders which shattered the circular wing principle. Aerodynamically speaking, circular wings aren't efficient. A half-moon or capital "D" shape, with the flat part toward the back, is much better. There can be no doubt about it. But there exists another path. The Germans discovered through the use of the rotating wing vehicle, which is in essence an autogiro with a multibladed propeller, some of them touching others, forming a perfect circle and linked together by an outer ring and a fixed central dome. The tube that emerges from the lower part is the jet exhaust, which could be moved to maneuver in mid flight (like squid do). Blade rotation was accelerated and aimed upward for take-off. Upon acquiring speed--and tremendous inertia--the blade angle was changed from -3 to +3 degrees, and the device would take off all of a sudden. There was no need for a system to maintain the cockpit stationary, since the blades rotated independently, with no torsion factor as is the case with autogiros. The prototype flew in the Prague aerodrome in 1943. It was a very promising design and its only flaw was its flight control. It seems that the final version had two engines: one with a steerable double exhaust over the disc itself and another underneath it. I believe they would have managed to control the differential flow of the four jets to obtain some rudimentary form of control, but without the use of computers, they would have not managed this before the war's end. Justo Miranda's expert analysis lead to a variety of paths of reflection. To Miranda and other aeronautical experts, putting aside the exaggeration and mystifications of conspiracy-minded ufologists, it is a fact that the Germans indeed built "flying saucers" and other surprising aircraft destined to change the course of history. 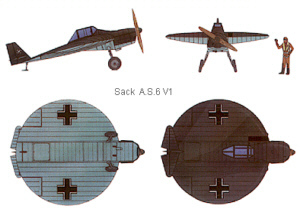 After the Nazi capitulation, the allies made off with documentation enabling them to reconstruct scientifically, and even technologically construct, revolutionary aviation prototypes designed by the German air force during World War II with the intention of changing the aircraft concept. The "Miracle Fighter", for example. The fantastic Focke-Wulf "miracle fighter" is one of the few German secret designs which was developed into publicly acknowledged military airplanes. Its story begins in 1942. German aeronautical research records for that year include a report by the Aerodynamic Testing Center in Göttingen, entitled "The Flying Wing". In this report, authors E. Von Holst, D. Küchermann and K. Solf examined the possibility of conceiving an aircraft that would combine the propulsion and lifting bodies, based on the flight of dragonflies as a source of inspiration. The original idea called for a powerful, fuselage-mounted propulsion engine to power two wide-diameter, inverse-rotation propellers. 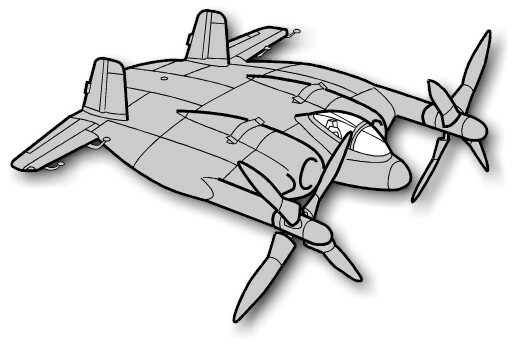 The lightweight and simple turboprop engine had not yet been developed. As Carlos Simó correctly points out in the Encyclopedia Más Allá de los Ovnis, such a vertical take-off device could revolutionize German aeronautics. In the fall of 1944, the "miracle fighter" project had been calculated with great detail, and when compared to other fighters from the same time period, it should have had extraordinary flight performance: 1000 KMH had been calculated as its maximum ground speed, and some 840 KMH at an altitude of 11,000 m.. The initial elevation speed would be 25 meters per second, which would be reduced to 20 meters per second at cruising altitude. Setbacks in the development of the propellers, according to Sengfelder, and the utter defeat of the Germans, kept this most interesting aircraft from ever making it off the drawing board. The blueprints fell into American hands, who realized in June 1945 that an advanced fighter was about to be born. These documents were stamped SECRET and the ramjet-powered wing was never officially built. Nonetheless, in spite of the belief that the miracle fighter was never officially developed, the fact is that the U.S.--ultimate destination of the information liberated from the Nazis--built at least two aircraft suspiciously similar to the revolutionary German project. These were the Lockheed XFV-1 "Tailsitter" and the Convair XFY-1 "Pogo", both equipped with fixed wings. In either case, propulsion was provided by means of a 5,850 HP Allison YT40-A-14 turbine, and two reverse propellers 4.8 meters in diameter. Although test flights could be completed with relatively favorable results, the U.S. Navy was not interested in "tail take-off" and the project was abandoned. This is, at least, the official story. The Germans have built a secret weapon coinciding with the holiday season. The new device, which appears to be an aerial defense weapon, resembles the glass ornaments used to decorate Christmas trees. They have been seen suspended in the air over German territory, sometimes alone, and sometimes in groups. They are silver in color and appear to be transparent. It seems the Nazis have sent a novelty into the night skies over Germany. These are the strange and enigmatic spheres known as Foo Fighters, which run along the wings of Beaufighter aircraft and secretly fly over Germany. For more than a month now, pilots have encountered these seemingly-unknown wonder weapons in their nocturnal flights. The fireballs appear all of sudden, follow airplanes for kilometers at a time, and according to official reports, appear to be guided from the ground by radio. These fireballs described by the news media of the time are known to ufologists as "Foo-Fighters" and Allied pilots considered them to be, at the time, some sort of Nazi secret weapon. At 0600 hours on December 22, at an altitude of ten thousand feet, near Hagenau, two very large and glowing orange lights rose quickly from the ground and straight toward us. Once airborne, they followed our airplane under perfect control (by ground controllers). Their fire seemed to extinguish as they headed off. The remainder of this report is censored. Evidently, it discussed the unforeseen "illness" of the on-board radar. Two nights later, the same pilots crossed the Rhine and were surprised by a flaming red ball that suddenly "turned into a sort of airplane whose upper half was built like a wing. It then glided away and vanished." In the fall of 1944, an experimental center sponsored by the Luftwaffe at Oberammergau, in the Bavarian Alps, should have finished research on electrical devices capable of interfering with running engines at a maximum distance of 30 meters by means of intense electromagnetic fields. Damaging the ignition circuits of an airplane engine would have caused the vehicle to fall from the sky. To make the invention efficient and practical, German technicians hoped to at least triple the useful radius of the weapon, but by the time the war was over, experiments to this end were barely even on the drawing boards. Meanwhile, as a subproduct of this research for immediate military use, another center under the joint control of the Speer Ministry and the S.S. Technical High Command had adopted the concept of "radio proximity disturbances" of interference on the much more delicate and vulnerable electronic devices found on American fighter planes. This, a round, shielded flying machine was born, more or less similar to the shell of a large turtle. It flew by means of a special jet engine, also flattened and circular, reminiscent of Hiero's Aeolipile, and generating a great halo of luminous flame. It was both unmanned and unarmed. Radio-controlled up until takeoff, the device would then automatically follow enemy aircraft, attracted by their exhaust fumes and approaching them without colliding, which was enough to throw their radar equipment into disarray. The flaming peripheral halo was obtained by means of a very "rich" combustion and chemical additives which intensely ionized the atmosphere near the airplane, subjecting on-board radar to powerful static fields, generated by large shielded klystron radio tubes which provided special anti-collision and anti-thermal protection. A metallic arc flowing with alternating current in the proper frequency (in other words, equal to those used by the radar station) can block the blips--the return signals appearing on the screen. The Feuerballs, while visible at night, practically eluded the reach of the most powerful American tracking devices of the time. The device's builders hoped that Allied aviators, once the "harmlessness" of the luminous globes had been determined, would abstain from opening fire on them out of fear of being engulfed in the aftermath of an explosion. In fact, on more than one occasion, American pilots believed that there was some German technician on the ground with his finger poised on a button, ready to make the Foo Fighter blow up. The Feuerball project was originally started at the Wiener Neustadt aeronautical installations, with the collaboration of Flugfunk Forschunganstalt (FFO) in Oberpfaffenhoffen for missile guidance (but was it really a missile?). The first witnesses of the device's early test flights, not yet equipped with its electronic gadgetry, stated that "...by day, it resembled a luminous disc spinning around its own axis, and looked like a burning balloon at night." Hermann Göring inspected the project several times, because he expected--as indeed happened--that the mechanical principle could result in an offensive weapon capable of revolutionizing the field of aerial warfare. When the Russians began advancing into Austria, construction of the first Feuerballs was apparently continued at underground workshops in the Black Forest, operating under Zeppelin Werke. The klystron tubes were provided by the Forschunganstalt der Deutschen Reichpost (FDRP) division of Aach b. Radolfzell on Lake Constance, and later, also by Gehlberg. These latter products would be of a lower quality than the previous ones, which demanded the simultaneous use of more "Feuerballs" operating in formations. Vesco's information on the Feuerballs is obviously disconcerting, particularly if we keep in mind that some pilots stated the balls of fire were capable of piercing through the fuselage and the cockpits of their airplanes. And more so if we consider that this same phenomenon (fire balls) has occurred in many other paranormal contexts. The Foo Fighter mystery, therefore, persists up to this very day, since pilots continue being assaulted by strange balls of flame. One of the most important modern cases was the one involving a commercial flight of the Spantax airline between Tenerife and Las Palmas (Canary Islands) on September 17, 1968, piloted by Cmdr. Julián Rodríguez Bustamante. The official files on this case, which the Spanish Ministry of Defence considered Top Secret for over 25 years, were recently declassified. It is surprising to see that the phenomenon witnessed by Cmdr. Rodríguez and his co-pilot Ibáñez Rubia is described as a Foo Fighter by the Air Operations Command, when it is immediately and incorrectly related with the controversial phenomenon of ball lightning (the identification of Foo Fighters with ball lightning stems from the cooperation of two civilian ufologists with the Spanish Air Force. Their tendentious evaluations and arguments regarding this case are utterly groundless). At the time, Cmdr. Rodríguez told me, after recounting his encounter in great detail, that he rejected the "secret weapon" explanation of his UFO sighting. Of course, I agree it's highly unlikely that secret Nazi weapons would have been tested in 1968, and over Spanish skies yet. It seems that if Project Feuerball really existed, those wonderful secret guided weapons would have been one thing, and the Foo Fighters seen before the Second World War, and which still pursue our pilots today, would have been something else. Some modern authors have fashioned a fantastic "consparanoid" theory out of some myths concerning Nazi secrets, such as the building of extremely sophisticated flying saucers, the Third Reich's highly symbolic content, Hitler's esoteric education and devotions, and the legend about the Nazi Empire's re-emergence after its reorganization in some other part of the world. W.A. Habinson, mentioned earlier, wrote that: "In May 1978, at Stand 111 of a scientific expo at the Hannover Messe Hall, some gentlemen were handing out what could at first glance be construed as a conventional scientific magazine of condensed news articles, entitled "Brisant." It contained two seemingly related articles. One of them dealt with the scientific future of the Antarctic, and another discussed Germany's WWII flying saucers. 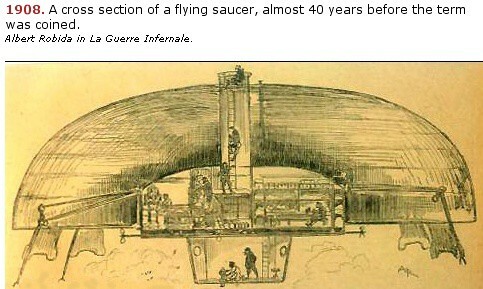 The saucer article stressed all the aforementioned information (on Schriever's "Flying Top", Miethe's vehicle, etc. ), but added that the research centers for "Project Saucer" had been located in the Bohemia and Mahren regions. In regards to this, it should be noted that Prague is in Bohemia (it seems one of the first trial flights of these craft took place in Prague), which is more or less surrounded by the Harz, Thuringia, and Mahren mountains. Vast subterranean research complexes existed in this region, only a few hundred kilometers from Prague. The article also included reproductions of detailed designs of a characteristic WWII saucer, making no mention of the designer, and claiming that they had been altered by the West German government in order to make their publication "innocuous"...added to this explanation, the anonymous author pointed out later that during WWII, such devices, whether civilian or military, had been submitted to the nearest patent office, where they were automatically considered secret (in compliance with lines 30a and 99 of the Patent-und Strafgesetzbuch) and taken from their owners by the research agencies of Himmler's SS. According to the article, some of these patents disappeared into secret Russian archives at the war's end. Others did the same into equally secret American and British archives. The remainder were lost along with several members of the Waffen SS and German scientists. Since neither the British, nor the Americans, nor the Russians will ever reveal what they discovered in Nazi Germany's secret factories, it is worth noting that in 1945, Sir Roy Feddon, one of the heads of the German tactical mission for the Aeronautical Production Ministry reported: "I have seen enough of their designs and production plans to understand that if they had managed to protract the war only by a matter of months, we would have been faced with a number of deadly elements from an entirely new form of aerial warfare." Around 1956, Captain Edward J. Ruppelt, then in charge of Project Blue Book, had stated: "At the end of World War II, Germany had developed several types of airplanes and guided missiles, mostly still in the planning stages, but they were the only devices similar to the UFO phenomenon in their behavior." One of these circular aircraft was the V-173, better known by its nickname--the Flying Flapjack. The V-173 had already been tested in 1942 based on the ideas of Charles Zimmerman (mentioned earlier). 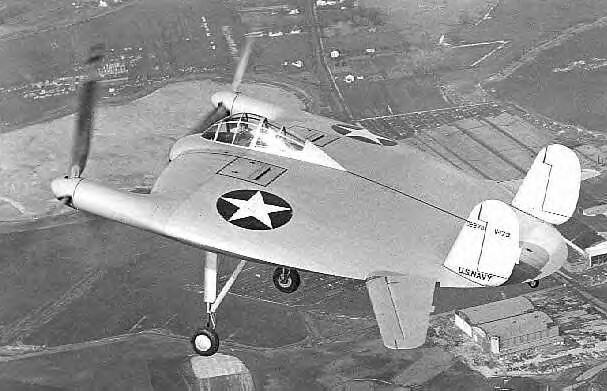 When the saucer psychosis broke out in the U.S. in 1947, the V-173 (perfected as the XF5 U-1 later on) was blamed on all the UFO sightings made over American skies. However, the XF5U-1 prototype crashed during a test flight in 1948, and the V-173 was consigned to oblivion at the U.S. Navy Air Station in Norfolk, Virginia. It is important to bear in mind that the UFO phenomenon kicks off in 1947, in the form we now recognize, as a result of observations made by Kenneth Arnold over Mount Rainier. Paradoxically, Arnold didn't see "flying saucers," rather, he witnessed a formation of nine boomerang-like devices, or "D"-shaped with the straight section aimed backward (the reader will recall the comments made by Justo Miranda regarding this most aerodynamic shape). It was a journalistic error that assigned Arnold the term "flying saucer." What really matters is that the saucer myth spread quickly across the U.S., and then throughout the rest of the world. Arnold, along with subsequent authors, believed that he had witnessed some secret weapon being tested, rather than alien spacecraft. The years following the Mount Rainier sighting were filled with scorn toward UFO witnesses and the suspicion that the U.S. government was developing new secret military aircraft. A few years ago, a former American federal agent stationed at the Spanish-American air base in Zaragoza, provided us a video "for military use only" depicting the test flights of one of these saucer-shaped vehicles. But the story of the Canadian-American saucer had begun much earlier. Nothing is easier to believe than that flying saucers are the later development of a psychological antiaircraft weapon that had already been used by the Germans. During nocturnal missions over Germany, I was sometimes lucky enough to see discs or luminous globes following our formations. It was known that German night time fighters were equipped with powerful strobe lights on their bows or within the propeller housing (strobes which would suddenly bring their lights to bear upon the target, partly to make more visible, but more than anything, to blind the tailgunners on the bombers). Due to this, there were often alarms which caused continuous nervous tension among the crews, affecting their performance in combat. During the final year of the war, the Germans sent a certain number of guided objects (the Feuerballs or "foos") to tamper with the ignition systems on our engines and the on-board radar. American scientist have probably adapted the invention and are probably developing it to the new measures of aerial attack and defense. This testimony in favor of the origin of UFOs as a postwar development of secret weapons was far from being the only one. On the other hand, the allusion to the concept of a "psychological weapon" is very interesting. This very same notion is featured in a memorandum from the CIA's director, released from official secrecy by FOIA (Freedom of Information Act) and the legal initiatives undertaken by Ground Saucer Watch in their lawsuit against the CIA during the '70s, seeking to obtain the agency's confidential UFO information. On the other hand, Andreas Epp, a theoretician of vertical flight and a designer of flying saucers during World War II, and who is still alive, told a German television producer that his design had been "expropriated" and developed by Nazi engineers. Furthermore, it had managed to fly prior to the war's conclusion. Epp has two photos of his "flying saucer" in flight, taken in Vienna near the end of the war. The fact is that Epp's photographs are identical to those of any discoidal UFO seen today. Like many others, he has no doubt that flying saucers exist, but are built here on Earth. Naturally, there is an unsoundable chasm between military saucer designs, held under the strictest secrecy, and those which were subsequently developed by civilian aeronautics. July 9, 1953, witnessed the maiden flight of the Rolls-Royce Thrust Testbed. The "Flying Bedstead", which provided invaluable data for the VTOL program, lifted its 3000 kg. weight vertically off the ground by means of the raw thrust provided by its escape gases. Two 427 liter tanks gave it an endurance of only 10 minutes. Yet another example appeared in the scientific press, in 1961. It was the XR-62 Rotoplane, a VTOL aircraft (vertical take-off and landing) capable of attaining speeds of 282 KMH and as its very name indicates, depended on the rotation of its large 4-meter circular wing. The Rotoplane had a rising speed of 180 miles a minute, thanks to a 260 hp Lycoming engine permanently connected to a variable-tilt propeller. Like any helicopter, the strange circular airplane could hover in the air, and its promoter, aeronautical engineer Ben Kaufman, was hoping to develop an entire fleet for military and civilian applications in the future. 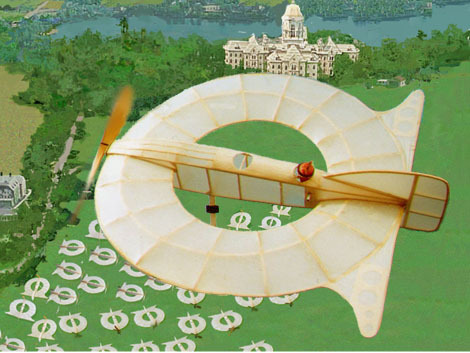 The circular airplane's original design was 7 meters long, 6.7 meters wide, and 2.4 meters tall. With two engines and a cargo capacity of 50 kg., it had an overall weight of 840 kilograms. Its ceiling was of 1300 meters. On the other hand, among the stack of papers that GSW manage to retrieve from CIA archives after the judicial process based upon the Freedom of Information Act, there were numerous references to prototypes and designs for earthly UFOs. According to these documents, Dr. Edward Ludwig told a Chilean journalist on July 13, 1950, that the "flying saucers" being seen in the U.S. reminded him of an entirely different kind of aircraft that was being developed during the years in which he worked at Professor Junker's research plant in Dessau. Needless to say, these were discoidal craft. Another document makes reference to a patent for a "flying saucer" presented in the former West Germany in 1952 by Rudolf SchrIever (creator of the controversial "flying top"). In this instance, there is mention of a test flight made over Prague in 1942. The "Nazi saucer" would have reached an altitude of 12,400 meters in 3 minutes, and a speed of 2,200 KMH. This craft is the prototype of a giant `flying saucer' designed to revolutionize air transport. Designed by British firm, Airship Industries, the Skyship was planned to cruise at about 100 miles an hour at an altitude of 5000 feet. Mention must also be made of the disc-shaped vehicles--up to 20 meters in diameter--built in 1955 by John Searl, a British engineer, or the antigravitational technology applied to discoidal craft by Italian researcher Marcel Pages. There are many other examples. Many of them, still experimental in the 1960's, are currently available in the commercial market: these are the "domestic saucers".